Today I worked like a yeoman, wrapping presents and making a, ahem, Provencal Winter Squash Gratin to take to my mom's for Christmas Eve. 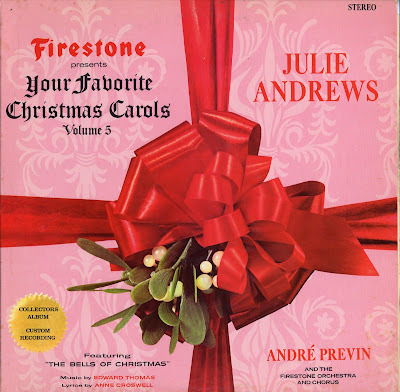 It took forever and while I worked I listened to my Firestone Christmas records on my Sputnik-era stereo. Those Firestone Christmas records are everywhere! But I did not have them until a month or so ago, when I was at Goodwill with my mom. I decided it was a good time to pick up these Firestone albums, because Christmas was coming up, and I grew up with these records, so it would be fun to have them. Boom, boom, boom, boom, boom. I bought them all. The green one, the blue one, the yellow one. With Julie Andrews, Roberta Peters, Franco Corelli, Gordon MacRae. I did not even take the records out of their sleeves to look at them! And the Ghost of Christmas Past must have smiled on me. Because over the last couple of weeks I have been playing these albums. And there is not a scratch on them! These records are in mint condition. So today I listened to Jack Jones singing, "It's That Time of the Year." And Roberta Peters singing Mozart's "Alleluia." It was funny remembering being a kid and listening to that. My sister Katie and I, we knew nothing about opera and we absolutely could not handle Roberta Peters' voice. We would go to pieces. Then later as a teenager I bought "The Magic Flute" and there she was singing the Queen of the Night. Finally I understood why she needed a voice like that. It is funny to think of an era where they would give out records like this. They had this guy Irving something-or-other conducting the Firestone Orchestra and Chorus. Someone has posted part of the green Firestone album here. And one of the commenters writes you would get the albums when you gassed up the car. OK. It is time for a Christmas list. I have wanted to do this for years. Christmas carols I love, perhaps to be followed tomorrow by Christmas carols I can't stand. Leonard Pennario and I used to play this game in California while we were out to dinner and the sound system would be throwing Christmas stuff at us. 1. "Lo, How a Rose E'er Blooming." Kind of awkward in English but the greatest Christmas carol ever. Michael Praetorius wrote wonderful melodies. 2. "In dulci jubilo." I guess I am a sucker for medieval German carols. 3. "O Come O Come Emmanuel." Technically this is Advent but so what. 4. "Here We Come a-Wassailing." Simple but good. 5. "Adeste Fideles." Probably should have put this first, love it so much. Love to sing it in Latin. We learned it in Latin in school. 6. "Hark, the Herald Angels Sing." A few weeks ago when I heard the Buffalo Choral Arts Society at Our Lady of Victory, this was the one number that did not sound out of place among all those angels in the basilica. You need a superhuman and Mendelssohn was one. 7. "Ihr Kinderlein Kommet." This is a German song. 8. "O Holy Night." Gotta love it. 9. "Ding Dong Merrily On High." This is an old French medieval tune. I used to prefer "Angels We Have Heard on High," which I still love, but this one now has the edge. 10. Zut alors, I am down to one! I'll say "Christmas Time Is Here," from "A Charlie Brown Christmas." Brings back my bar-going days. You would be out having drinks with your friends and this would always be playing. I know I have forgotten many. I will wake up in the middle of the night wondering why I did not mention this or that. Perhaps tomorrow I will write Part Two. After I finish this eggnog. HerrGott! No "Stille Nacht"? Even when a descendant of the Rev. Joseph Mohr, who wrote the words, built the organ for Buffalo's German St. Mary's Church during the Civil War?